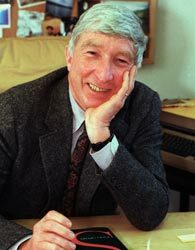 John Updike is one of America’s most beloved authors, known for “The Witches of Eastwick,” the “Rabbit” novel series and his final work, “The Widows of Eastwick,” published just months before his death on January 27, 2009. John Hoyer Updike was born in Reading, Pennsylvania on March 18, 1932. An only child, he was raised by his mother, Linda Grace Hoyer Updike, an aspiring writer, and his father, Wesley Russell Updike, a high school science teacher. The three lived with his grandparents in Shillington, Pennsylvania for much of his childhood. When he was 13 years old, the family moved to nearby Plowville and lived in his mother’s birthplace, a farmhouse on an 80-acre farm. As a youth, Updike was an avid reader of “popular fiction, especially humor and mysteries,” according to his Academy of Achievement biography. His mother encouraged to him draw and write. He was president and co-valedictorian of his class at Shillington High School and earned a tuition scholarship to Harvard University. There, he contributed stories and cartoons to the humor magazine The Harvard Lampoon, and spent summers working as a copy boy for the Reading Eagle. He met his first wife, Mary E. Pennington, at Harvard; they married before graduation in 1954. After Harvard, Updike and his wife Mary moved to the United Kingdom, where Updike studied at the Ruskin School of Drawing and Fine Art at Oxford University. While there, Updike met E.B. and Katharine White, editors at The New Yorker, who encouraged Updike to take a position at the magazine. In 1956, the couple returned to Manhattan with their first child, and Updike became a staff writer at The New Yorker. After two years, the family, now numbering four, moved to Ipswich, Massachusetts, where Updike resolved to earn his family an income through freelance writing. Updike lived out his life in Massachusetts, spending his final days in a hospice. He died of lung cancer on January 27, 2009. The announcement was made by Nicholas Latimer of his longtime publisher, Alfred A. Knopf. Updike continued to write until his final months, publishing a review of Toni Morrison’s “A Mercy” in the November 3, 2008 edition of The New Yorker and a short story, “Nessus at Noon,” in the winter 2009 issue of The American Scholar. This article was originally written by Liz Colville; it was updated January 31, 2017.